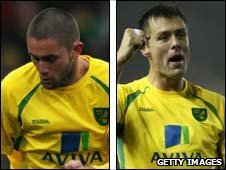 Norwich City defender Elliott Ward and midfielder Henri Lansbury are expected to be sidelined "for a few weeks", according to boss Paul Lambert. Neither player was fit enough for Tuesday's 4-2 Championship win over Sheffield United at Carrow Road. Lambert told BBC Radio Norfolk: "Elliott's got a calf problem at the minute and Henri's got a hamstring. "It's not like I've just got fringe players out, I've got a handful there that are first team players for me." Lansbury, 20, could have played his last game for City as he is set to end his loan spell and return to parent club Arsenal on 16 January. Lambert is already without midfielder Andrew Surman through injury and defender Leon Barnett still has one game of a two-match ban to serve. Midfielder Simon Lappin picked up his fifth yellow card of the campaign against the Blades, meaning he is suspended for the New Year's Day visit of QPR. But left-back Adam Drury and centre-half Zak Whitbread are back in full training and both were on the bench on Tuesday. "If you look at them two [Ward and Lansbury] and Leon being out, Drury out, Surman out, you've got five lads who are virtually going to start for you," added Lambert. "It's a hell of a chunk, that's too much to carry. "You've got to give the lads who came in a lot of credit for what they're doing, they're a close knit group at the minute." Wes Hoolahan proved to be the inspiration for the Canaries' against the Blades. The 28-year-old attacker scored a hat-trick after being introduced as a half-time substitute. But the Irishman, who played 37 times in Norwich's League One title winning campaign last season, has made just two starts in City's last six games. "It's never easy when you're leaving somebody out who's been important to what's happened in the last 17 months," said Lambert. "It's always a big decision but he's never once moaned about it or anything like that. "He's been great for me, it's just a decision you make, you try and pick a team you think might win a game, but his two penalties were great because you've got to hold your nerve."